Burnt food is one of the most common kitchen disasters that occurs every day. This is disastrous in the sense that cannot be undone. You will have no choice but to start over again if you haven't burnt your kitchen with it! Under cooked food is embarrassing and dangerous as salmonella thrives on raw meat. It is especially awkward when it reaches the table, and your guests start noticing! But no worries, this is easy to fix. A few more minutes in the oven can solve this problem. What if your soup is salty? What if you have put too many salty ingredients on it and still added some salt? What if the salt container lid accidentally pops open while pouring some salt? Is there a way to fix it without ruining the flavor? Is there a way how to make soup less salty? The good thing is, there are ways to make your soup less salty. 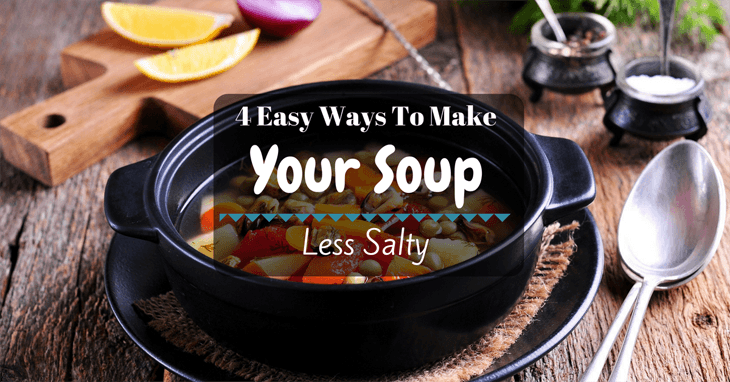 Maybe you haven’t just thought of it yet, but in this article, I can teach you a few method to fix and balance the saltiness of your soup! The following are the things you might need depending on your recipe. 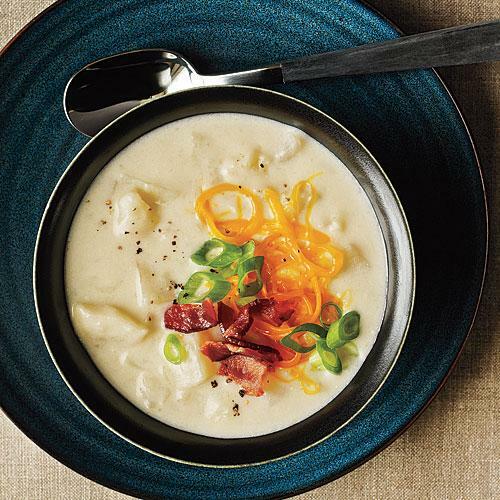 Different types of soup may require different kinds of remedies to balance the saltiness. The simplest way to fix a salty soup is to dilute it. It is an easy method, and you can do it without pouring so much effort. Diluting soup with water or soup stock can be an effective way to solve your problem. 1. If it is too salty, scoop a few cups of soup. Do this first so that you will not use too much soup stock to fix it. If you are a fan of unlimited bowls of soup, feel free to skip this. 2. Place your soup over low fire. Boiling will only further reduce your soup and make it saltier. If you make this mistake, you might need a few more cups of stock. To avoid this, use low fire. 3. Gradually add soup stock or water. Be careful, by adding more water or stock as over dilution can result to a bland soup and you would have to salt it again! ​It can never be simpler than that. The tricky part is balancing the taste. Do not forget to check for taste. If you have soup stock available, favor it over water for a more flavorful outcome. Tip #1: If you are making gazpacho and it turns out to be salty, you can just dilute it with more just add more water or stock and taste it before putting it in the fridge. Tip #2: In case you are making raw vegan soup and put too much salt, just dilute it with any other liquid ingredient. Another way to reduce the saltiness of your soup is by confusing the tongue. Adding more flavor to your soup can conceal saltiness. Aside from reducing saltines, it can also add up to the taste. This only works on a slightly salty soup. If your soup is too salty, you can use the method above. 1. Place your soup over low fire. Avoid boiling it to top reducing your soup! 2. Depending on your preference, you can add some sugar, lemon/lime, vinegar or chili. Some people want some citrus in their soup. Some would want it a bit spicy. So choose which one you and add a little portion at a time. 3. Taste and adjust gradually. Put one small dash of your chosen flavor at a time. 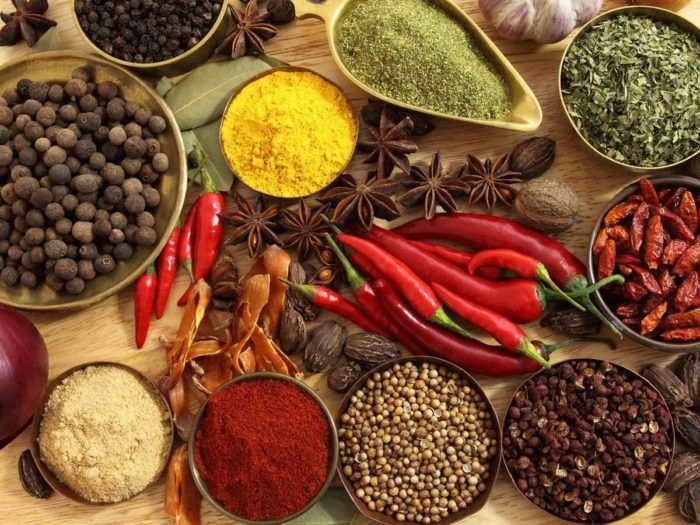 If you desire, you can mix and match different spices to make an exciting character. Some people add a dash lemon or chili powder in their soup when it is served. Some other sprinkle some vinegar or a bit of freshly ground pepper to suit their taste. This method may turn adversity to an opportunity to explore other flavors. Tip: You can torch some nuts and crush it to add some smoky flavor. Have you noticed why some pasta sauces are salty when not mixed with the noodle yet? Starch and starchy food have this ability to neutralize the salt. That is why a salty pasta sauce is just right when mixed with the noodle. A popular way to reduce saltiness in soups is to soak a potato to magnet the salt. To do this, get some potatoes, cheesecloth, and a few inches of twine. 1. Cut potatoes in cubes to multiply the surface area and increase the amount of salt it can accommodate. If you don’t cut the potatoes, it will take more time for the soup to penetrate its core. 3. Heat the soup over low fire. Crushing your potatoes can even speed up the process and make it more efficient. This may cause your soup to thicken a bit. If you are aiming for a clear soup, skip this as this may discolor your soup to slightly yellowish tint. One more way to reduce the saltiness of your soup is by thickening it with cornstarch. We have established above the effects of starch on food, and this method employs the same principle. The thing you might want to consider is the texture of your soup. Adding cornstarch will thicken your soup. If you are okay with a thick soup, go for this one. 1. Dissolve about one teaspoon of cornstarch per liter of soup in half a cup of water. Adding cornstarch to the hot soup will give you a lumpy texture. Do not skip this step. You want to mix cornstarch that is already dissolved in water so that it can quickly mix with the soup. 2. Heat soup over a low flame. 3. Mix your cold cornstarch solution and stir continuously for 1-2 minutes or until thoroughly diluted over the soup. Failing to do this may leave you with lumps of starch. 4. Taste to check for desired saltiness. To make the most out of this method, you might want to consider combining it with method 1. Adding a few cups of soup or water together with cornstarch can be an effective way to reduce saltiness in your soup. Now that you can fix your salty soup, let’s look at some things to watch out for when preparing a dish. There might be some things you have overlooked while cooking. Now, to avoid that, we can follow some of the tips listed below. Secure the lid of your salt container. Some mistakes came from accidentally spilling a large amount of salt in the soup. This might seem like a freak accident, but believe me, sometimes, it happens. Add seasoning one small amount at a time and taste to check. When the main ingredients are already cooked, put it on low fire. The longer your soup boils, the more water will evaporate. Your soup will become saltier as it is reduced. If you are using canned ingredients, check to see if they are soaked in brine. The salt soaked in your ingredient can be diffused in the mixture of your soup and add up to saltiness. Accidentally pouring a significant amount of salt while cooking your soup is a rare phenomenon. But it is not impossible, and if you happen to be on this point, there are several ways to fix it. Some methods will require a few things, while some others need more attention. Dilution is one surefire easy way to do it. 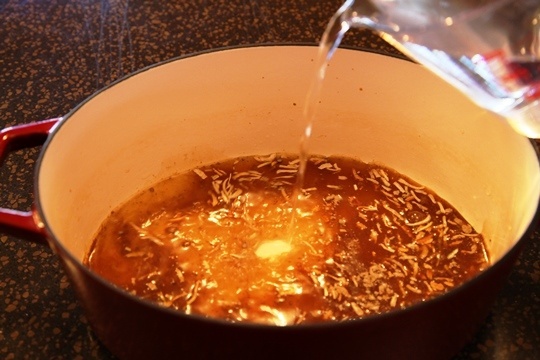 Using soup stock instead of water can preserve the flavor you have already mixed with it. You can also add a dash of different flavor to confuse the tongue and conceal the saltiness. Adding a few pieces of cubed potatoes is a classic way to address this problem. They are an effective way to magnet salt in your soup. Same goes with thickening your soup with cornstarch. All these methods can help you reduce the saltiness in your soup. Choose the one that best suits what you need!